Darin Potter’s passion for outdoor writing began at the age of twelve when he first began writing in a journal that his parents bought him on a family camping trip in Northern Michigan. Eventually, his writings became published in Michigan-Out-of-Doors Magazine, Michigan and Ohio Outdoor News, MidWest Outdoors Magazine, and Modern Pioneer Magazine. 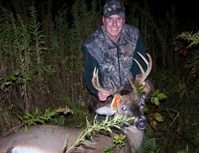 Darin is a member of the Michigan United Conservation Clubs, National Rifle Association, Commemorative Bucks of Michigan, and the Michigan Outdoor Writers Association. 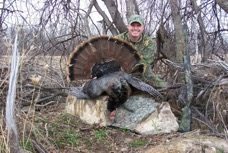 Darin is also the creator and editor of Beards and Tines a blog about hunting whitetails and wild turkeys. To date, he has four turkeys and one whitetail buck recorded in the CBM Big Game Records Book. He is also a certified Michigan Hunter Safety instructor and an International Bowhunters Education Program instructor. Currently, Darin is employed as a Park Ranger at the Rifle River Recreation Area for the DNR Parks and Recreation Division.